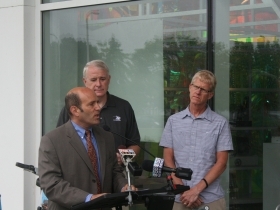 Today marked the official unlocking of Milwaukee’s first bike-sharing station. 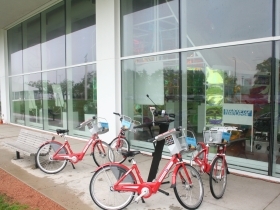 The demonstration B-Cycle station currently has 10 bikes and is located in front of Discovery World. The bikes are available at $8 for the first hour, and $5 for each additional half hour. 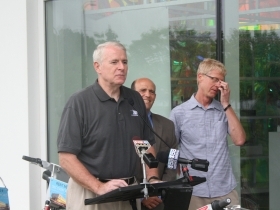 This morning Bruce Keyes, of Midwest BikeShare Inc., told the crowd, during the official launch, that by March 2014 there should be 240 bikes at 24 stations, including ones at US Bank, Schlitz Park, and Library Hill Apartments. 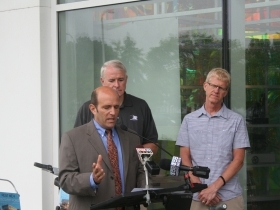 Keyes thanked the Brico Fund, Local Sustainability Matching Fund Awards and the City of Milwaukee for supporting the project. He mentioned that membership rates weren’t finalized but should be in line with similar systems, approximately $70 for a yearly membership. “We are proud that Milwaukee is taking an important step,” said Keyes, adding that this first step will be followed up with a larger rollout in 2014. Brian Conger, from B-Cycle, explained that Milwaukee is following a pattern similar to Houston, TX, which rolled out with a small system and quickly expanded. As Kevin Hardman, Launch Director Midwest BikeShare Inc., put it: “biking is believing.” Meaning that once people tryout bike-sharing they will become believers. 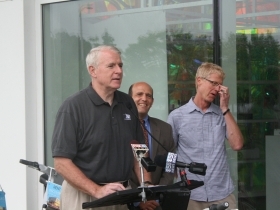 Barry Mainwood demonstrated how easy it was to use the station and let Mayor Tom Barrett give the system a whirl, locking and unlocking a bike. 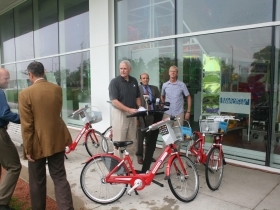 And so began the bike-sharing system in Milwaukee. I’m confused by the pricing model. What does a “daily membership” mean? Do you pay $8 to use the bike(s) for the day? Then, what about the $5 for each additional half hour? And how does this relate to the $70 yearly membership? I’m sure that I am not the only one confused by this. It seems quite expensive at first glance. @Christian V Yeah it is a little confusing as the station today is setup really to act as a demo of the bikes and learn to use the machines. Today is basically $8 for the first hour with $5 for every half hour afterwards (more like a bike rental rate). But the pricing-model will be different then when the full system rolls out. When the full system rolls out your daily or yearly membership will come with a free 30 minutes (NYC is actually 45 mins for annual members) per checkout with unlimited checkouts a day. So the bikes will be used as quick transit. You’ll grab one and zip over to the next station and check it in, for no additional fee. Then if you want to go somewhere else check it out again and still no additional fee as long as you check it in within 30 minutes, at any station in the system. Love to see this up and running. But I still wish they would have used available funds to install all the lakefront locations, making this a mini start-up system. I think people would get much more excited if they ride within a network, rather than one demo station. Either way, awesome! Let’s hope they secure the additional 800k required to get this off the ground. I am not opposed to this if it is self sustaining from an economic standpoint. I would prefer the city invest in bike lanes rather than grants to promote this program. I am however quite surprised that I have seen no comment, photo or a mention in any story about helmets. (Despite the fact that the Bikeshare logo has a cartoon rider wearing a helmet). You are encouraging citizens to ride bicycles in urban areas and you apparently cannot rent a helmet with the bike. Are you expected to carry one with you all the time in case you choose to ride a bike that day. Personally, I am indifferent to people wearing helmets when they bike and believe you do that at your own risk, however, I would guess that there is a potential liability associated with injury or death caused by an accident on one of these bikes if the rider isn’t wearing a helmet. @Joe I want bike lanes as well and bike-sharing as they go hand in hand. There are 535 bike-sharing systems around the world and to my knowledge helmets are, thankfully, only required for two of them (which has hurt ridership and use). And Bike-sharing operates today in 20 U.S. cities, including New York City, which at last check has had over 500k rides with only 3 minor injuries. The lack of helmets is often brought up as a “concern” with bike-sharing systems, but actual use has shown it isn’t a problem. As of July 8, the NYC bike share program reported 837,775 trips and over 1.9 million miles since their Memorial Day launch. The miles they report seem to be only the station-to-station distance, not the actual distance ridden. For example, if I take out a bike, ride a total of 4 miles, and then return it to the same station, they report “0 miles”. The numbers NYC is posting are really impressive! >>>>>I am not opposed to this if it is self sustaining from an economic standpoint. Joe, bike-share systems are legitimately a form of public transportation. Virtually no existing form of public transportation (bus, rail, etc) is self-sustaining from an economic standpoint. Why should bike-share systems be held to a different standard than other forms of public transportation? I’m in Zürich right now and was amazed to discover yesterday that they have year-round free (deposit-required) bike “rentals” for up to 6 hours, co-sponsored by the Lung Association (less emissions, more aerobic exercise), and a variety of other entities. The cable car a few blocks away runs 6am to midnight every 6 minutes. And the trams and buses run everywhere every few minutes. You only need to allot six minutes of slack time to ensure that missing your bus doesn’t mean losing your job. On the train the other day I met a wealthy recently-retired couple from Florida who were marveling that they’d never before thought of taking the train and had always rented cars when they’d come here before, and they never realized till now that they could have had such a better time by coming without a car. None of these transit modes are transportation of last resort. The public investment in transit here makes public transportation not only the most cost-effective but also the easiest and most convenient way to get around.